This is the aquarium in downtown Denver. It was a lot of fun and Camille was in heaven. She got out of the stroller and loved being right up to the glass. A big fish would swim by and Andrew would freak, Camille would scream with excitement. We went to a three game series between the Braves and the Rockies. The Braves lost all three which was very disappointing but we still had fun. We had great seats (not seen pictured above, we moved late in the game so Millie could crawl around) and Camille acted tolerably. Luckily her and I were able to take the train from our hotel to the stadium so Andrew and Dave could enjoy batting practice. We made reservations to tour the US Mint while we were in Denver. Dave and I found it pretty interesting, unfortunately they were not actually making any money last week but it was still cool to see how things were done. The kids were not that huge of fans, Camille made sure everyone on the tour knew she wanted to be taking a nap by letting out a high pitch scream every once in a while. The Denver zoo was one of our last visits. It was fun but hot. Of course the weather had been absolutely perfect until this day but we still had fun. They had the cutest baby orangutan that was only two weeks old. We probably all sat and watched it interact with its mom for a half hour! The vacation was great, tons of swimming at the hotel which I think the kids will miss the most but we are glad to be home sleeping in our own beds. So Kevin and Jen's wedding was this weekend and of course I took no pictures but I stole one from my sis-in-laws blog to show the skirts. I made all 16 skirts (I take that back, my wonderful neighbor made the purple ones) for the wedding. I think they turned out to look great! 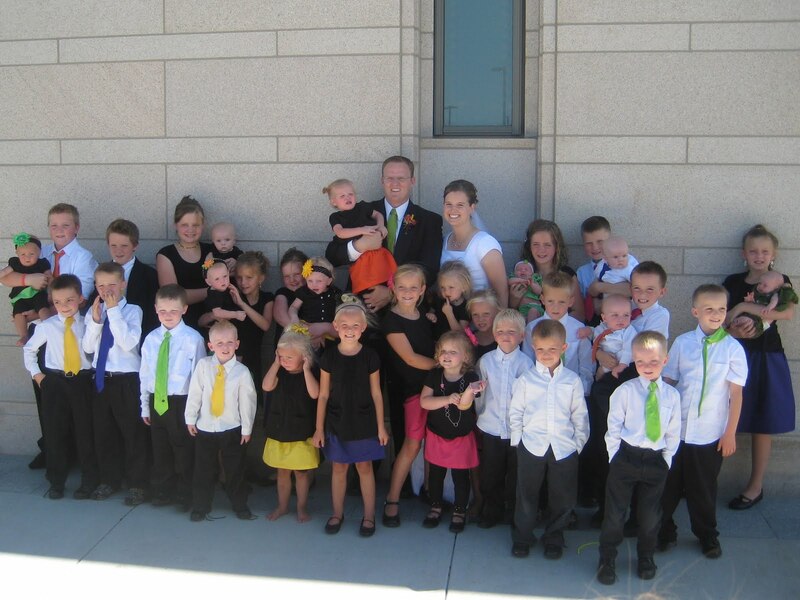 This is all 33 grandkids with the happy couple! It was so much fun having everyone together for the first time in forever! I am now excited to use the leftover fabric to make them a quilt but I put my sewing machine away so I don't have to look at it for a while. I don't think I could stomach that yet. I told them to not expect anything until their first anniversary!